Partners in Preservation, an initiative of American Express and the National Trust for Historic Preservation, is going to distribute $1 million in preservation grants to institutions in the Washington, D.C., area. Twenty-four historic properties are competing for grants. The winning preservation project will be determined primarily by voting on the Web. (See additional details below.) A person can vote for a favorite preservation project once a day through May 10. 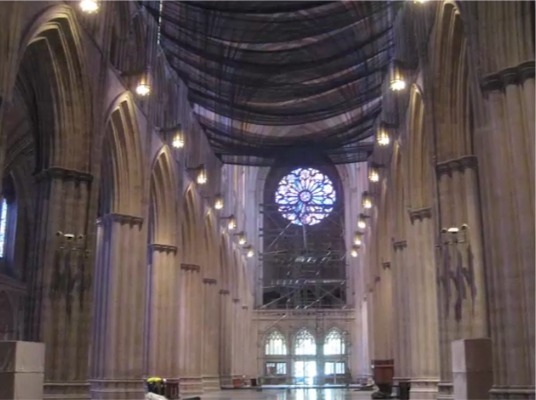 Frame from video showing safety netting now in place inside the cathedral. You can find a video about the cathedral project here, along with a button that links to a page where you can vote. To vote, you will have to create an account on the Partners in Preservation site or login with your Facebook account, which is probably easier. The sites seeking grants are listed here, where you can also watch a video about how the competition works. Sites mainly earn points through Internet votes, but, if you visit a site, you can also earn points for its project using Instagram or Foursquare. Grants for non-winning organizations will be awarded by a committee. For as long as I have been tracking the competition, which began on April 24, Washington National Cathedral has led the pack. Its closest competition had been from Sixth & I Historic Synagogue. Lately, however, Mount Vernon has moved into second place. The home of President Washington could provide serious competition! As I write this, the cathedral has 226,680 votes. Mount Vernon has 213,620. The synagogue has 207,150. 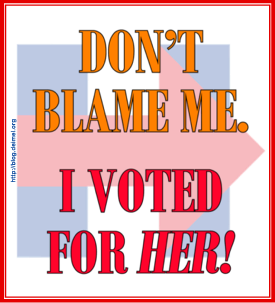 It is easy to forget to vote, of course, but the cathedral will send you a daily remainder via e-mail if you like. Sign up here, at the bottom of the page. Update, 5/15/2013: Washington National Cathedral did indeed win the $100,000 grant. See the announcement here. In my last post, “Remembering the Bad Ol’ Days,” I called attention to Harold Lewis’s complaint about how Diocesan Council, under the influence of Bishop Duncan, decided that a number of resolutions that had been proposed for the 2004 annual convention of the Episcopal Diocese of Pittsburgh were declared to be too divisive to be considered. As it happened, Harold’s was not a lone voice crying out in the wilderness. Progressive Episcopalians of Pittsburgh, which had had a hand in producing the suppressed resolutions, issued a brochure aimed at shaming the diocesan leadership into reconsidering their action and at encouraging deputies to insist on taking votes on Resolutions #4–9. The cover of PEP’s tri-fold brochure on buff-colored card stock is shown at the left. You can view the entire brochure, which characterized the six “controversial” resolutions here. As it happens, the resolutions were on the convention’s agenda, but the allies of the bishop were prepared to make sure that none of them passed. The minutes of the convention, which were published in the final 2004 Convention Journal, explain what happened. Dave Hoover, St. Peter’s, Uniontown, member of Diocesan Council, moved Resolution #4 be postponed indefinitely; seconded. Mr. Hoover spoke to the motion stating that Diocesan Council has recommended almost unanimously that a vote would cause greater division than what currently exists. The Bishop stated that our rules of order allow for 20 minutes of debate on each resolution with no deputy speaking more than once. Debate followed; vote on the motion to postpone indefinitely: voice vote inconclusive; standing – passed. Resolution #5 suffered much the same fate. In this case, the Rev. Stan Burdock, another Diocesan Council member, offered the motion to postpone indefinitely. Resolution #6 was also postponed, this time by a motion from the Rev. Linda Manual. The Rev. Philip Wainwright offered a motion to postpone Resolutions #7–9, but Bishop Duncan postponed entertaining the motion pending the announcement of voting results and instructions for the next ballot. Before resolutions were considered further, however, the bishop announced that the time allotted for convention business had expired, so no action was taken on Resolutions #7–9. There was no motion to extend debate, and no objection for 5 minutes of prayer with an announcement; the Bishop called the President of the Standing Committee, the Rev. Doug McGlynn, forward to lead prayer with other members of the Standing Committee. Dr. McGlynn requested that Canon Catherine Brall and Mrs. Kathleen Marks join him. Noting we were at a critical point in our diocese, Dr. McGlynn asked for prayers for reconciliation and a right heart towards one another. Therefore, as God’s chosen people, wholly and dearly loved, clothe yourself with compassion, kindness, humility, gentleness and patience. Bear with each other and forgive whatever grievances you may have against one another. Forgive as the Lord forgave you. And over all these virtues, put on love, which binds them all together in perfect unity. Let the peace of God rule in your hearts since as members of one body you were called to peace. And be thankful, let the word of Christ dwell in you richly as you teach and admonish one another with all wisdom and as you sing psalms, hymns and spiritual songs with gratitude in your hearts to God. And whatever you do, whether in word or in deed, do it all in the name of the Lord Jesus, giving thanks to God the Father through Him. A period of prayer followed. The Bishop then announced that with the advice and consent of the Standing Committee and in light of the continuing civil suit brought by two of our parishes and the deepest desire to turn this from its present course, in order to encourage the process of resolution and reconciliation, if it please God, and in order to open all the means of response possible in the situation, notice was given under Canon 15, Section 6 of the canons of the Episcopal Diocese of Pittsburgh that consideration of the dissolution of the union between the Convention of this diocese and the parishes of Calvary Church, East Liberty, and St. Stephen’s Church, Wilkinsburg, will be a part of the agenda of the next meeting of this convention whether that be a special or annual meeting. The Bishop stated that he made this announcement with deepest grief, but the Canons require that it be made at an annual convention. The suit has extended for 13 months. He expressed himself the previous day as to what he believes is the proper course. This does not mean Convention will have to do this, but that it’s an un-hoped for possibility. What is not reported in the minutes is that the bishop spoke to Harold and Diane before the second day of the convention (November 6, 2004) began and urged them to withdraw the lawsuit. The two rectors refused. The subsequent threat to use Canon 15, Section 6 against their parishes made the request to terminate litigation look a lot like blackmail. Harold and Diane left quickly after the business of the convention concluded. On behalf of Progressive Episcopalians of Pittsburgh, I immediately telephoned the Presiding Bishop’s chancellor. Bishop Duncan’s threat was never carried out. By the time of the 2005 annual convention, parties in the Calvary lawsuit (as the litigation was generally called) had signed the stipulation that ultimately assured that diocesan property would stay with The Episcopal Church. Why rehash all this history now? Bob Duncan has gone, and the Diocese of Pittsburgh has a new diocesan bishop. 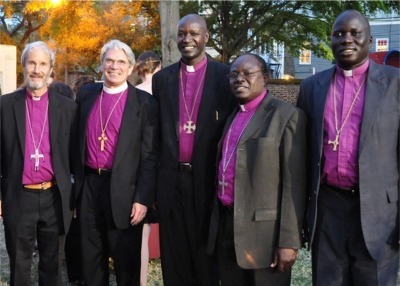 Well, after major factions of four dioceses have left The Episcopal Church, it should be obvious that (1) Bishops in The Episcopal Church have too much power; (2) the church is reluctant to act in a timely manner against bishops who abuse their power; and (3) the tools for reining in rogue bishops are limited. The task force that is considering changes to the church’s polity should be considering not only how The Episcopal Church can be run more efficiently (read “cheaply”) and how it can enhance its “missionary” character. It should also consider how the church’s polity can be changed to limit the power of bishops and make it easier to get rid of rogue bishops before they inflict too much damage to their dioceses and to the general church. To date, it does not appear that the general church has learned very much from the experiences of San Joaquin, Pittsburgh, Fort Worth, Quincy, and South Carolina. Update, 4/15/2013. I revised my description of Bishop Duncan’s conversations with Harold Lewis and Diane Shepard. The conversations occurred before the convention session, rather than at the end of it, as my original post implied. I remember the first time I heard someone speaking of googling something. I was already familiar with Google, and I immediately understood the usage, but the incident did give me a start. The verb to google has since become commonplace. Although one could argue that the verb should be capitalized, it usually isn’t, something about which Google should probably be concerned. The duke he never let on he suspicioned what was up, but just went a goo-gooing around, happy and satisfied, like a jug that’s googling out buttermilk; and as for the king, he just gazed and gazed down sorrowful on them new-comers like it give him the stomach-ache in his very heart to think there could be such frauds and rascals in the world. My unabridged dictionary does not list google; I don’t know if the usage in Huckleberry Finn was common at the time, was dialect, or was invented by the author. I suspect it was not an invention. You can amaze your friends by using to google in a sentence in a context that has nothing to do with the Internet.